New Delhi: In an endeavour towards development of sustainable buildings in Gurugram, GRIHA Council organized the GRIHA-NASA Trophy at the 8th GRIHA Summit today. 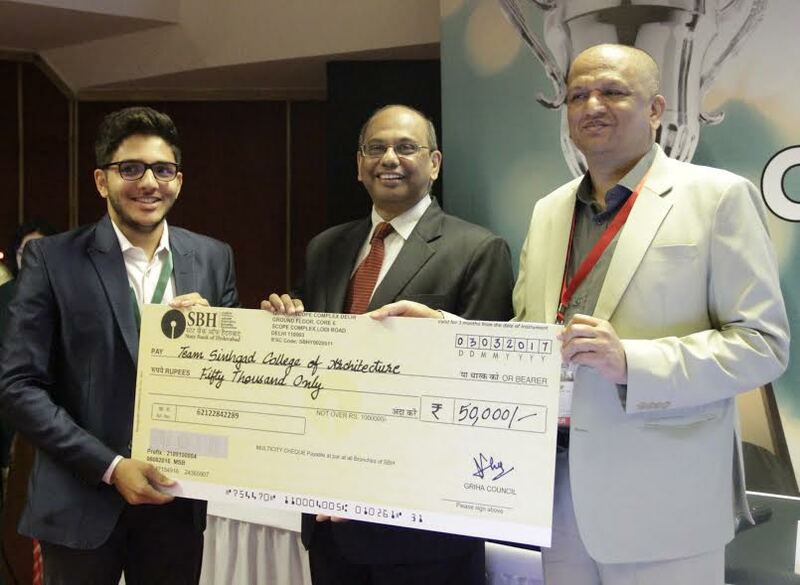 Sinhgad College of Architecture won the Trophy at the 59th Annual NASA Convention 2016-17, organised with the support of Experion Developers, Gurugram. The GRIHA-NASA Trophy is awarded by The GRIHA Council under the aegis of The Energy and Resources Institute (TERI) and the Ministry of New and Renewable Energy (MNRE), Government of India, in partnership with the National Association of Students of Architecture (NASA). This year the competition required students to design a sustainable office complex for Experion Developers, a reputed developer committed to sustainable development. The complex, situated at the 32nd Milestone, NH8, Gurugram, was expected to make the best use of the site while providing special attention to massing, solar orientation, wind movement and passive cooling systems. The proposed design was not only required to be designed with least environmental footprint, but also to create spaces that inspire and inculcate environmentally responsible attitude in all the visitors to the complex. The design required to demonstrate the architectural strategies to inculcate sustainable behaviour of the users. The idea is to highlight the climate responsive and passive features of the proposal. The design will create the energy and resource future through green commercial buildings suitable to Gurugram. The competition this year witnessed an overwhelming response from the students with participation from 73 colleges. The entries were evaluated by an eminent panel of members, comprising renowned names from the fields of architecture and green building – Architect Pranay Deep, Architect Sangeeta Maithel, Mr. M Ramachandran, Sr. General Manager (MEO – Services), Experion DeveloperPvt. Ltd. The designs were evaluated on two parameters – 70% on the basis of innovation in architectural design in terms of effectiveness of the design in influencing user behaviour to be more sustainable through spatial experience, and 30% on the presentation of the scheme. Architecture, Mumbai and Vastukala Academy, College of Architecture, received special mention for their designs.